Losing a hope-filled dating relationship is a stressful and painful event. And when it seems to occur again, again, and again, what is the refuge for a Christian single? While most books for singles tell readers how to get the next guy, When Love Ends and the Ice Cream Carton is Empty encourages a healthy healing process. Practical and biblically based, each chapter guides the reader through a metaphorical day of restoration. Twilight recognizes and deals with endings, night validates and grieves the loss, dawn awakens hope, and day is the new beginning based on the solid assurance of Christ. Chapters conclude with discussion questions for individual or group study, helpful Bible verses, and a prayer. 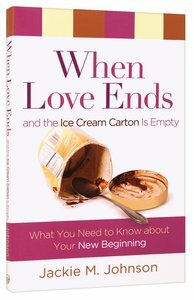 About "When Love Ends and the Ice Cream Carton is Empty"